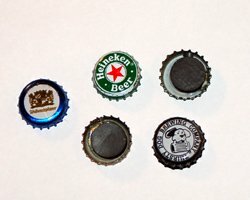 These bottle cap magnets can be made easily from your favorite bottles of beverage! 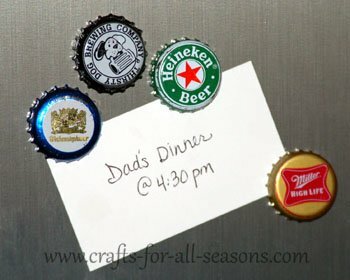 Dad will love these on his refrigerator, or on his metal tool box. Begin saving your favorite bottle caps. If you need to use a bottle opener, take your time so you don't bend the cap. 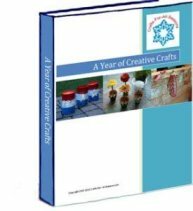 CLICK HERE for Joann.com, they sell the strong magnets that you need for this craft. 1. The magnets are made by simply gluing the button magnets to the back of the bottle caps. The magnet is very strong, so it is important to use a very strong glue or else the bottle cap will come off when you try to remove the magnet from a metal surface. I originally tried a hot glue gun, but the glue was not strong enough.